Development writer and international negotiations watcher Biraj Swain discusses with Samir Saran of Observer Research Foundation, Bidisha Pillai of SAVE the Children India, Amitabh Behar of National Foundation of India and Mukul Sanwal, career bureaucrat and India’s chief climate negotiator at 1992 Rio the recently concluded United Nations Sustainable Development Goals Summit which were gavelled in New York in the last week of September. They discuss the goals themselves and what they hold for us and our future and our children’s future. The panelists pick their favourite ones. They discuss India’s pitch and participation, and if the over-presence of private sector, is that making the global public good, the UN, a compromised entity. The close by discussing the road ahead for SDGs in India, for Indians. They also listen in from one of India’s youth delegate at the UN, Anoyara Khatun, on her aspirations and expectations from India and world leaders. 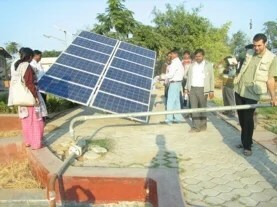 A solar-powered pump in India. India’s vow to unconditionally cut emissions intensity 33 to 35 percent below 2005 levels and boost the share of non-fossil-fuel energy sources more than threefold as long as it receives assistance from Western countries was widely praised by the environmental community, even as some said the world’s third-largest emitter could do more. Referencing yoga, ancient Sanskrit texts and Mahatma Gandhi—on whose 146th birthday the plan is being formally unveiled today in New Delhi—the submission argues that India’s right to pull itself out of poverty is not necessarily incompatible with protecting the environment. At the same time, it lays out some hard-as-coal truths. “In order to secure reliable, adequate and affordable supply of electricity, coal will continue to dominate power generation in future,” India’s intended nationally determined contribution (INDC) reads. The blueprint outlines an action plan for decarbonizing energy-intensive sectors like transportation and building. It vows to create an additional carbon sink of 2.5 to 3 billion metric tons of CO2 equivalent through additional forest and tree cover by 2030. It also details what India must do to protect water, agriculture and communities’ health and physical safety from floods, droughts and other increasingly devastating impacts of climate change. Not part of the target but highlighted as a major undertaking was India’s current goal of expanding its current 35 gigawatts of clean energy capacity to 175 GW by 2022, while responding to a fourfold energy consumption growth. The price tag for its clean energy efforts: around $2.5 trillion between now and 2030. The INDC does not say how much of that should come from the international community, but argues that “meaningful and adequate” finance will be key to achieving the targets. India’s down-to-the-wire submission at the end of the final day available to countries to file their plans to the United Nations makes it one of the last major economies to effectively take responsibility for tackling climate change. Among Group of 20 countries, only Saudi Arabia has now failed to turn in a plan for curbing greenhouse gas emissions. The INDCs from 120 countries, including the 28-member-state European Union, will collectively make up a new global climate change accord that leaders hope to broker in Paris in December. India, long viewed by the United States and Europe as an obstructionist in the negotiations, is expected to play a key—and, activists insist, increasingly positive—role. “This is a really significant step for India,” said Anjali Jaiswal, director of the Natural Resources Defense Council’s India Initiative, said of the INDC. She acknowledged that the government’s emissions intensity target could have been more ambitious—a target of 40 to 45 percent had been floated in the media. But, she noted, under the stated plan, India’s economy will grow seven times larger by 2030, while emissions will triple, rather than a typical 1-to-1 ratio. Singh described India’s approach as making note of the historical responsibility of wealthy countries that have been polluting the atmosphere for decades while also going beyond the old rich-poor divide. India’s INDC is markedly different from China’s in both style and substance. Unlike China, India offers no peak year for halting emissions growth. Energy experts said that comes as no surprise, given the nearly 400 million people still living without electricity in India. It also was released on Indian soil, timed to the birthday anniversary of the leader of the country’s independence movement. Chinese President Xi Jinping, by contrast, made China’s two major climate change unveilings while standing shoulder-to-shoulder with President Obama, first in Beijing last year and later in the White House Rose Garden. “India in some ways is the man in the middle. It’s an emerging economy, but it’s not a developed economy,” said Jaiswal. “India has demonstrated leadership in sharing common responsibility … through a differentiated proposition on action that seeks global partnership on the means of implementation,” he wrote in an email. Meanwhile, the goal of ramping up non-fossil energy to 40 percent also raised questions. Without hydropower, several energy analysts pegged India’s current levels at 12 to 14 percent. With large hydropower, however, the country is already at 30 percent non-fossil energy, making the jump less significant. The INDC does not specify what sources it is including—or if the projected growth also includes nuclear energy. Paul Bledsoe, a former Clinton White House climate staff member, said the plan “predictably” emphasizes growth through coal expansion, and called on India to truly show its commitment to climate action by agreeing to restrict hydrofluorocarbon gases (HFCs), a potent contributor to climate change, under the Montreal Protocol on Substances that Deplete the Ozone Layer. “India must also do more to encourage private-sector investment in solar and other clean energy, including by reforming their notoriously corrupt and inefficient government bureaucracy, or investors will stay away and throw serious doubt [on] their laudable renewable energy goals,” Bledsoe said. Varun Sivaram, Douglas Dillon fellow at the Council on Foreign Relations, said India is in a difficult position. Without moving away from coal and enacting major structural reforms in the utility sector, he noted, it’s unclear if even meeting the 175 GW of renewable energy goal would do much to reduce India’s emissions. NEW DELHI — India’s long-awaited pledge for a global climate pact shows how the world’s No. 3 carbon polluter is making significant efforts to rein in the growth of emissions linked to its fast-surging demands for energy, analysts said Friday. That means India’s emissions will continue to grow as its economy expands, but the increase relative to economic output will be lower than it is now. India was the last of the major economies to present its offer for the U.N. climate deal that’s supposed to be adopted in December in Paris. Javadekar said India held its submission back so it could coordinate its filing with the Indian holiday celebrating the birthday Friday of the country’s forefather, Mohandas K. Gandhi, an ardent environmentalist. Environmental groups following the U.N. climate talks welcomed India’s offer. “India now has positioned itself as a global leader in clean energy, and is poised to play an active and influential role in the international climate negotiations this December,” said Rhea Suh, president of the New York-based Natural Resources Defense Council. “This shows that key economic and infrastructure ministries have been closely engaged in formulating climate policy, which is an important break from the past,” said Navroz Dubash of the Centre for Policy Research in New Delhi. Climate analyst Samir Saran at the Observer Research Foundation, a New Delhi think tank, also described India’s targets as ambitious and “rooted in Indian reality,” given the fact that at least 300 million citizens — a fourth of the population — still have no access to electricity at all, while hundreds of millions more make do with just a few hours a day. Prime Minister Narendra Modi has made manufacturing and job creation a key promise of his administration, and has implored foreign companies and governments, with the slogan “Make in India,” to help. “This is a positive and novel Indian approach,” Saran said, adding that India was effectively sharing responsibility for taking action to protect the climate while seeking global partnerships on implementing those plans. Even with a major boost in renewable energy, India is also planning to expand coal power — the biggest source of emissions — to satisfy its energy needs. 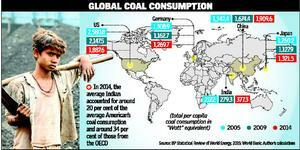 Coal-fired power plants account for about 60 percent of India’s installed power capacity. By 2030, the government said its installed capacity from “non-fossil fuel-based energy resources” would grow to 40 percent. Currently non-fossil sources account for about 30 percent — half of it solar and wind power and the other half large hydropower and nuclear. China and the U.S. are the only countries with higher emissions than India. As a bloc, the 28-nation European Union’s emissions are also higher. Like other developed countries, the U.S. and the EU committed to absolute reduction targets, while China pledged that its emissions would stop growing by 2030. India, with hundreds of millions still living in poverty, wasn’t expected to offer a peak year because its emissions are projected to increase for decades as energy demand rises along with economic growth. Javadekar said industrialized countries should be setting even more ambitious targets than what’s been pledged so far. “The developed world has polluted the world, but we will help even though we are suffering,” he said. This report has been revised to correct quote from Javadekar.